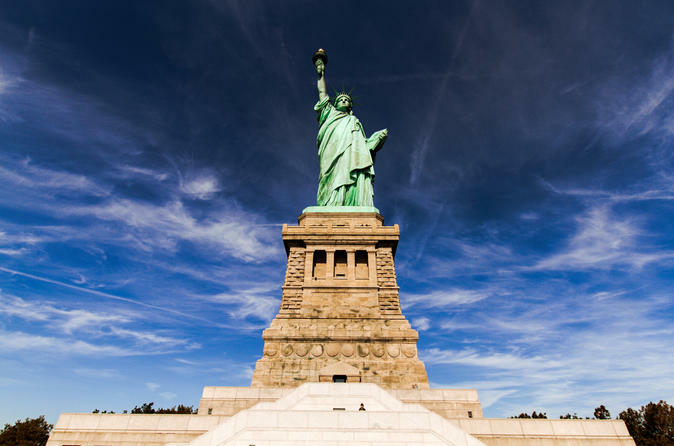 Get the most out of your time in the Big Apple with a full-day tour that combines three prominent sites of Lower Manhattan and New York Harbor: the Statue of Liberty, Ellis Island and the National September 11 Memorial & Museum. On a morning ferry tour, you'll enjoy priority boarding, enter the pedestal of Lady Liberty and visit the Ellis Island Immigration Museum. Then take a poignant tour of key 9/11 sites like St Paul’s Chapel before visiting the 9/11 Memorial. Finish at the 9/11 Museum, which you'll visit on your own with pre-reserved admission. Meet your guide at Battery Park in Lower Manhattan, site of The Sphere, a metallic sculpture recovered from the rubble of the September 11 attacks on the World Trade Center. Hop on the ferry with priority boarding, and enjoy the ride to Liberty Island during this quieter time of day. When you arrive, your guide tailors the commentary and pace of your tour to suit your group. Discover how the Statue of Liberty was created, and learn what the iconic landmark has in common with the Eiffel Tower. Then walk the 215 steps to access the pedestal of Lady Liberty to enjoy postcard views over Manhattan. Back on the ferry, make the short journey to Ellis Island, the historic immigration center for more than 12 million immigrants to the US from 1892 until 1954. Enter the restored Great Hall of the Ellis Island Immigration Museum, where your guide points out the Stairs of Separation. You have about 2.5 hours of free time here to explore the museum’s interactive displays independently; then return to Lower Manhattan on your own by ferry to grab lunch before meeting back up with your guide at Battery Park (lunch is at your own expense). Start the afternoon portion of your tour by walking with your guide to St Paul’s Chapel, where friends and family members gathered to hear news of loved ones and offer support after the September 11 attacks on the Twin Towers. Visit the church to see a more personal side of 9/11. Then follow your guide to the National September 11 Memorial & Museum, located at the site of the former World Trade Center. Stop by the 9/11 Memorial’s two reflecting pools, built in the footprints of the towers. You’ll hear stories of heroism and tragedy at the Fireman's Memorial, view the exterior of Freedom Tower and see the fascinating ‘Survivor Tree,’ whose rehabilitation and rebirth has become a symbol of resilience for New Yorkers. The last stop of your tour is best experienced on your own: the 9/11 Memorial Museum. With a pre-reserved ticket, you won’t wait in line, so say goodbye to your guide and head straight inside to view exhibits at a pace that suits you. At least one hour is recommended for your self-guided visit. At the memorial exhibition, view personal artifacts, archival documents and memorabilia, and hear harrowing first-person accounts of the events. You can also see a 3-part historical exhibition with multimedia displays that examine what led up to the attacks and reveal the aftermath, including stories of reckoning and recovery.